One look at native Texas artist Brian Grimm paintings reveals his God-given talent and lifetime passion for his craft. His painting process is a bit “old-school” but is a time-honored approach. Rough thumbnail sketches are developed. Once the final design and sketch are in place, a grid is hand drawn to enlarge to the canvas or board. A charcoal sketch is refined, then a wash of oil paint is used to develop values before the final painting. Study of Impressionist works and forming a foundation en plein air, furthered Grimm’s unique vision that resonates in his paintings. His “Rio Grande Casanovas” is the perfect cover art for this issue of TOJ. South Texas and across the Lone Star State wild turkey will be at the peak of their breeding season. 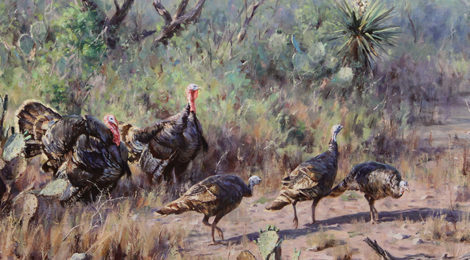 Gobblers will be displaying, drumming and strutting to gain the attention and opportunity to breed with receptive hens. Turkey hunters will also be afield for their annual adrenaline rush as they call in close one of the beautiful gamebirds. It is an exciting time for both hunter and the game pursued. For more information on “Rio Grande Casanovas” and other fine works of art or commissions by Brian Grimm, visit www.briangrimmart.com, email BrianGrimmArt@gmail.com or call (830) 456-6809.